Comfort zones. What are they anyway? I sometimes wonder if I even have one. Knowing when to leave your comfort zone can be tricky, particularly if you feel uncomfortable at the best of times. And this only gets harder when you're having a tough time in life. This is an alarming experience. Your comfort zone is a big part of how you define yourself. Things like, ‘I’m good at parties’. 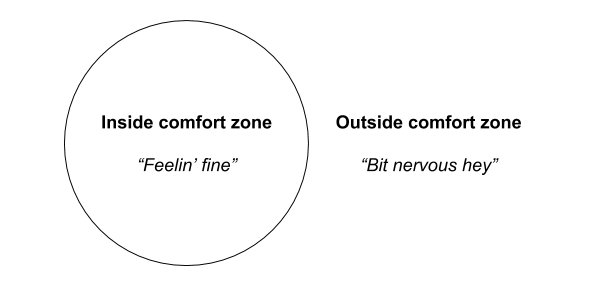 Or even things you'd never even think of as being inside your comfort zone until they're not, like ‘I don't get nervous in cars’. When you’re having a hard time, it becomes harder to make decisions about the future. This applies to the big life stuff. For instance: Should I go for this job? It might be just what I need. But if I mess it up, I'll feel even worse about my job prospects. Aaaand, unfortunately, this indecisiveness can also apply to the little stuff. Like: Should I go to this party on Friday night? I might have a life-changing conversation with a stranger. But what if it's not a party at all, just a room full of angry bats and oh god I can't remember any of their names?? We often interpret our indecisiveness as yet another sign of how messed up we are. I can’t even make a small decision, what’s wrong with me? Not a fun place to be. The thing is, it actually makes a whole lot of sense that even small decisions are difficult when you're in crisis. If your comfort zone is changing rapidly from day to day, you have no real way of knowing how you’ll feel about things even three days from now. You might feel fine about that party today, but when Friday rolls around be a nervous wreck. So you’re making decisions on very little data, and that can be disconcerting. The truth is, no one can be sure how they’ll feel in the future - particularly when it comes to the big, long-term stuff. But when you’re having a hard time this uncertainty becomes a lived everyday experience, rather than an abstract notion. So it makes sense that it’s harder to make decisions, big or small. It doesn’t matter what the scary thing is. For whatever reason, some of us seem to have a short memory when it comes to our own capabilities. For me it's parties. It doesn’t matter how many I go to that don’t end in public shaming or spontaneous imprisonment, if I’m in a sensitive place, every new party I’m invited to is an ordeal - right up until the moment I get there and have a totally great time. It comes down to confidence. I’m not confident in my ability to handle the situation. And then, I take this lack of confidence as a sign I really should be worried about this thing, because why else would I be so scared of it? But this is the truth about confidence: it's never there when you actually need it. You do the scary thing, convinced you’re going to fail. If you somehow pull it off (and then do it again, and again) maybe *then* you start to feel confident about that scary thing, way after the fact. Clearly you don't need confidence to do the scary thing, but it’s easy to forget that. You give confidence the credit for all that hard work you did before you had it. That means when something shakes your confidence, it’s easy to feel like you’ve suddenly lost your ability to do normal human tasks, even if the only thing that's really changed is how you feel about those tasks. Back in that first crisis of mine, when every day seemed harder than the one before, there was one thing I could still do: go on stage and play music to total strangers. You’d think this would be way outside my comfort zone. I certainly kept waiting for the day I’d have a panic attack on stage and have to completely rethink my career choices. I remember doing my first tour of New Zealand right in the middle of this scary time. I had to make a (not so popular) rule with my bandmates: no driving above 80kph, because some days at least, I would be literally filled with panic when we did. Yet each night I’d go on stage and feel absolutely fine. In fact, the stage was my refuge, it was the one place I didn’t feel totally weird and freaked out. But why? One night, after a particularly good show at Auckland’s Kings Arms (RIP), I had an epiphany. It’s not that I don’t feel weird and freaked out when I’m on stage, it’s that when you’re on stage you’re *supposed* to feel that way. We just have a different name for it. As performers, we call it nervous energy, and it has a purpose: to give you the energy to get up and entertain a room of strangers. And best of all, those big, nervous feelings also have a pay-off. You walk off stage, and you feel amazing. The more nervous you were before the show, the better you’ll feel after. It’s an act of personal alchemy, and it’s awesome. I still return to that epiphany now, ten years later. When I’m freaking out about something - like going to a party - I ask myself, if this were a performance, would the way I’m feeling make sense? And the answer is always ‘yes’. The others at the party may not realise they signed up for a show. In fact, half of them are probably much more worried about their own performance to notice mine at all. But it is a kind of performance nonetheless. Will your comfort zone get bigger or smaller? When you are having a hard time, it's like you lose your middle ground. It becomes nearly impossible to have just an ‘ok’ day. Either today is one of those bright days you push yourself and make a tiny bit of progress, or else it’s a flaming wreckage that undoes everything. It can feel like there’s nothing in-between. That first crisis was not my last crisis. I made a resolution back then which I still return to when times are tough: to the best of my abilities, I will do one thing outside my comfort zone, each day. One thing. Some days that might be performing to a room of people. Other days it might be making the effort to look someone in the eye as I talk to them, for just a millisecond longer than I want to. Whatever the scenario, my guts and hammering heart will tell me in these moments that there is no choice, that the only option is to curl up and lament my ever-declining life capabilities. Of course they will tell me that. That's what it feels like outside your comfort zone. But, there *is* a choice: to curl up, or to do the uncomfortable thing. But here's a really important point: this doesn’t mean you always have to step outside your comfort zone. If it’s really a choice, then both options have to be acceptable. As Honor said to me once, ‘sometimes life needs to be a little smaller’. There's nothing wrong with taking it easy, especially when - as we've discussed - even 'easy' doesn't feel easy.